We all know that the most sly and sneaky creepy crawler out there is the cockroach. This bug will eat our pizza or snickers bar if open and left out; it will even raid our pantries and refrigerators. Over a span of many years this bug has put up quite a resistance in the war against mankind. 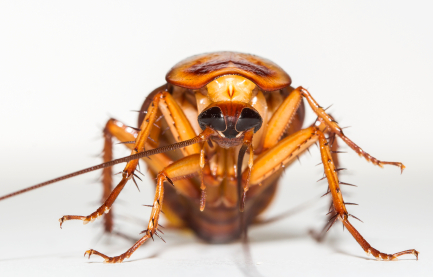 The roach is one of the most exterminated bugs by pest control professionals, but in the 1990’s in Florida, some of the exterminator’s tricks stop working. 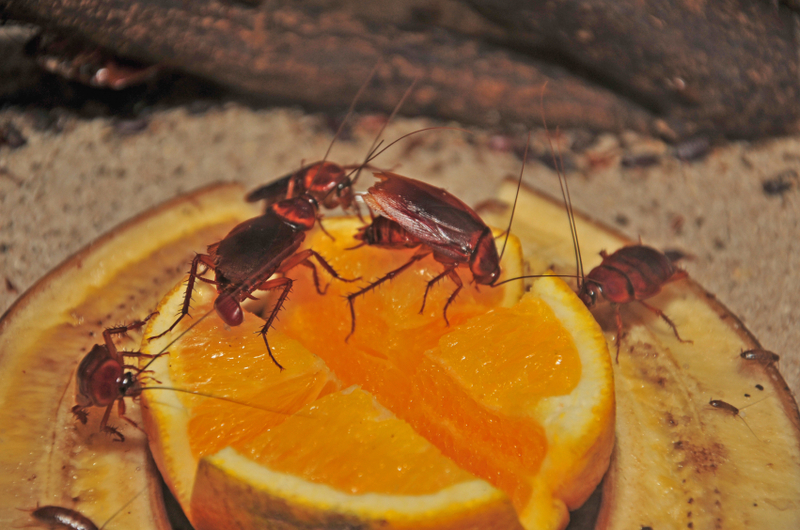 This was because the roaches developed a trick of their own; ditching their sweet tooth. One of the professional tactics used against cockroaches is baiting them with a sweet, sugary poison. In the 90’s when this bait stopped working, researchers started speculating about this seemingly invincible pest. How had the bug avoided the sweet scent and taste of the concoction? Researchers from Raleigh’s North Carolina State University, Ayako Wada-Katsumata, Jules Silverman, and Coby Schal looked into that very question. Using the common German cockroach, researchers studied the reason for this change in roach behavior. Roaches use taste hairs all over their bodies instead of taste buds to taste their food. Researchers focused on the taste hairs around their mouths and two types of nerve cells that transmit signals to the brain. One of these transmits the taste of bitterness, while the other transmits the taste of sweetness. When the brain received the sweet signal, the roaches were, of course, inclined to eat the substance, and when it received a signal of bitterness, the roaches laid off. The three researchers from North Carolina determined that glucose, which is the main ingredient used in most sugary products, stimulates the bitter receptor in the roach’s brain. Entomologist at Purdue University, Grzegorz Buczkowski, and Walter S. Leal, the head of the entomology department in the College of Agriculture and Environmental Sciences at the University of California, Davis who were not involved in the research, made some remarks on the findings. Buczkowski said, “We lose baits all the time.” He expanded by saying that the bug industry has to keep up with the evolution of these bugs in order to maintain the effectiveness of their products. New poisons are constantly developed, because cockroaches and other pests become resistant to the poison, just as bacteria become resistant to antibiotics. The findings now explain that it wasn’t an ineffective poison, or that the roaches developed immunity to it. The cockroaches simply changed their genetic make-up and lost the attraction to glucose. Now some roaches are passing off this gene and evolving into some sort of super roach. These results seem to be well on their way to helping the pest control industry and mankind in general to keep a leg up on the evolving cockroach. It’s incredible that they’ve made such a huge step in evolution in such a small amount of time. I wonder if this is a regular occurrence with insects – since they reproduce so rapidly and in such huge numbers, perhaps they evolve faster than more complex creatures that live longer and reproduce more slowly. That actually makes a lot of sense now that I think about it… I need to read more about this! Naturally all living things were also created to think and approach all sorts of favourable and unfavourable conditions. If one checks at close behaviour of cockroaches their living styles-habitats and habits we will conclude to have sober move compared to humans living in shelters. Safety, food source, are most we have discovered are monitored to their interests…. Seems to be true. I tried a lot of chemicals and sprays to kill them but nothing worked. Looks like they have developed a strong immunity to these stuff. The worst part is, they reproduce really fast. I’m thinking about hiring a pest control service to get rid of them. You’re spot on when you say that we need to keep up with the bugs, insects and pests in order to better know how to handle them. I think gel-baits work well, of course, when you diminish all other sources of water. They will be forced to take the bait to survive and would eventually die. That seems to be so cruel but we have to deal with these bugs, especially cockroaches as they’re very gross and breeders of diseases. Cockroaches are the hardest pests to get rid of, and are the most troublesome. But the truth is that the most powerful pest control methods are those administered by professional pest exterminators. It is an arms race between insect evolution and pest control professionals. New technologies emerge all the time to keep up. I imagine someday we will find a solution that evolution cannot match! Cockroaches are for real very stubborn compared with other pests species. The only solution is to give pest control professional operators to handle the cockroaches infestations whenever it occurs. Like ours, the specialized formulations when administered will automatically exterminate these insects instantly and gradually resulting in total wipe out and guaranteed not less than one year safe period for both residentials and commercials. This reminds of the movie ‘evolution’ where the characters had to termite the oversized bugs with head and shoulders shampoo. Hopefully they’re not evolving that quick. If they are, i’ll be freaking out over in the corner. Cockroaches are responsible for the transmission of many diseases, you should contact a professional pest control or visit http://www.prohealthpestcontrol.com/pest-control-services/ to protect your home from invasion of pests. Cockroaches are nasty insects to have around the house. They are unsanitary and are carriers of pathogenic bacteria. If you put them in the house then looks quickly talk of a plague. It is important that you take action immediately. I have searched a good link http://pestsolutionsnw.com/ . You should hire professionals because they have plenty of powerful insecticides to deal with cockroaches. It is important that cockroaches or other vermin will not come to feel at home with you.